8 Bike Ride Adventures to Explore New York City #infographic ~ Visualistan '+g+"
You can walk and not get far, you can take a subway underground and not get to see anything, or you can easily bike across the most beautiful places in New York City. Urban bicycling in NYC can be a ton of fun if you know where to stop along the way. About 49% of local New Yorkers ride a bike at least a few times a month, according to the New York Department of Transportation. Over the past few years, the city has built more than 25 miles of protected bike lanes, with a grand total of 460 protected miles across the city. 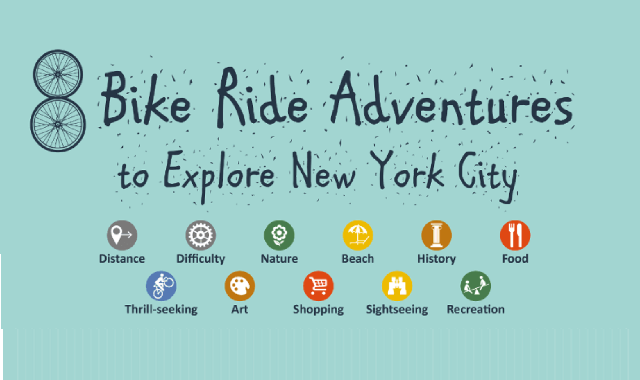 Exploring the city in the summer, fall, and spring via bike would be ideal whether you’re hoping to see Coney Island, to explore Central Park, or even to go mountain biking on a challenging course. We’ve highlighted the 8 best trails for tourist and locals hoping to have an amazing urban biking experience in New York City.